billboard's tweet - "Talking to #GRAMMYs presenters, @BTS_twt on the red carpet. On their new album: "We're working on it...it's going to be paying back our fans. We just hope that they love it." #ARMY "
the one with the glasses and the green hair whats their names? Jimin saying his is excited to see army is so heart warming, we feel the love.I absolutely love what Namjoon said, our humble boys. Enjoy the evening boys, you all look amazing. 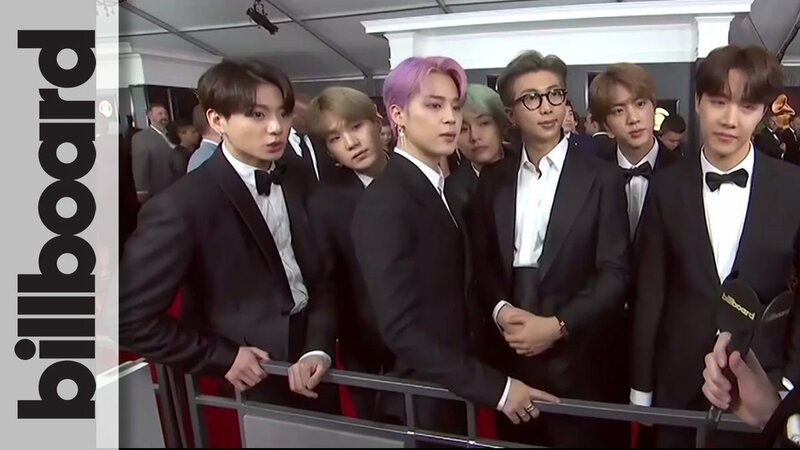 I @BTS_twt parlando ai #GRAMMYs sul red carpet. Riguardo al loro nuovo album: "Ci stiamo lavorando... sarà fatto per ripagare/ringraziare i nostri fans.."
Hablando con los presentadores de los #GRAMMYs, @BTS_twt en la alfombra roja. umm not to be obnoxious but what arena? Stadiums . S.T.A.D.I.U.M . Check out @DrWillieWilson for Chicago mayor. The only candidate that’s for real change here in Chicago. Bring back business, lower taxes, keep schools open. Get Chicago working again no more corruption. How could we not like your damn album it's gonna be a masterpiece?! Look at #Namjoon being a king, #Jimin saying #아미, #Jhope shining bright, #Jungkook behaving like a baby-bunny, #Suga like a lil meow meow and #Taehyung like a cute puppy, and look at #Seokjin just breathing and being perfect. "We hope they love it"
Hablando para los #GRAMMYs , los presentadores @BTS_twt están en la alfombra roja. their next album is dedicated to us, perhaps i’ll cry. My Man is so hawtttt!!!!!!!!!!!! !